Hey everyone! Say hello to October! With this month is a chilling cold day sometime. And I am looking forward to the end of the year. How I came up with this White hippie boho minidress? Well well well yeah just made my first dress and I want it to be cute and lacey style and must be easy too! So mini dress is perfect for a short gal like me lol. 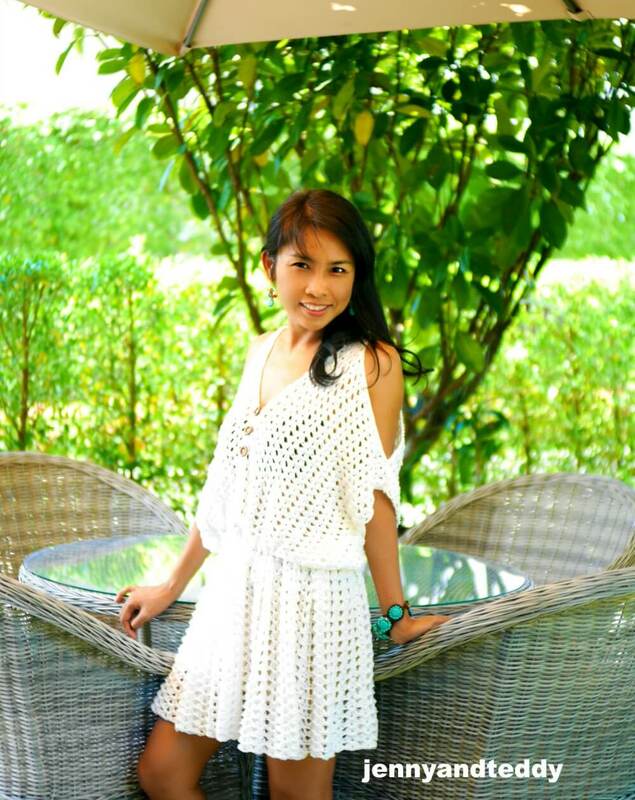 Mmmm….. and I like white color because white color is all perfect with the beach theme I suppose. With the lace and ruffle effect that I add in to this minidress , make it came out so cute. This mini dress it can covert to be the oversize dress as well by untie at the waist, how cool is that? And the cold shoulder thing make it look adorable too! 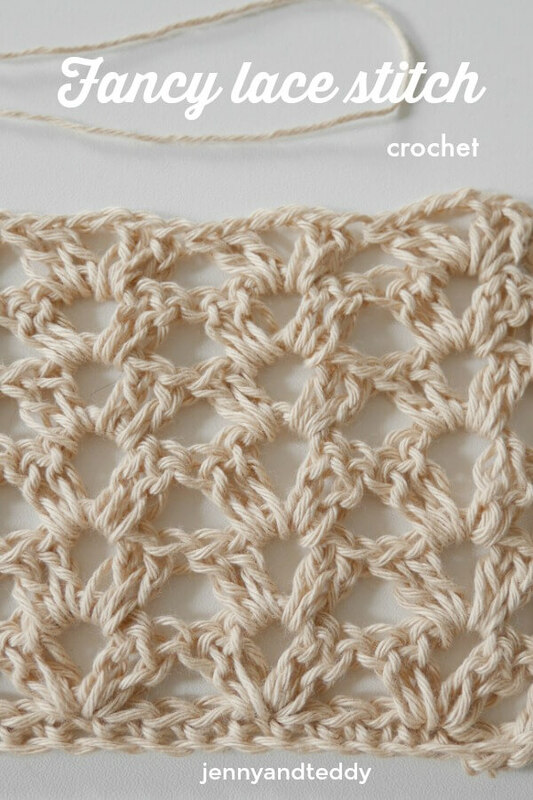 It’s basically made up from 4 rectangles top down and the lace stitch is so easy for beginner called fancy lace stitch. 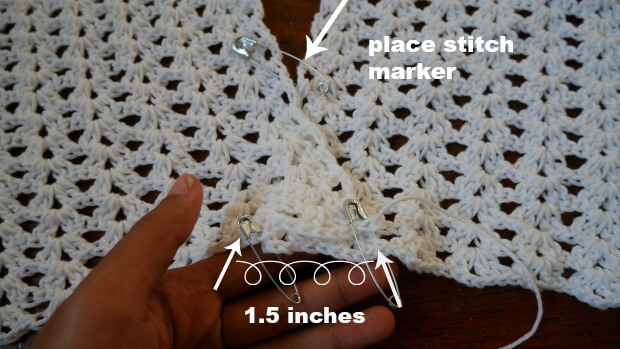 These fancy lace stitch I had use in many crochet top project like Dolly ruffle top and Summer lovely tunic. 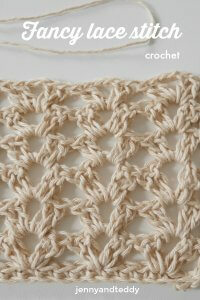 I use cotton yarn for this project. This mini dress or oversize dress is made in size small to medium. 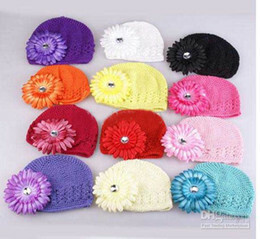 the other sizes are easy to adjust by just add more chain to the foundation chain to make it bigger. see pattern below. Top part make 4 pieces. The measurement of one rectangle. 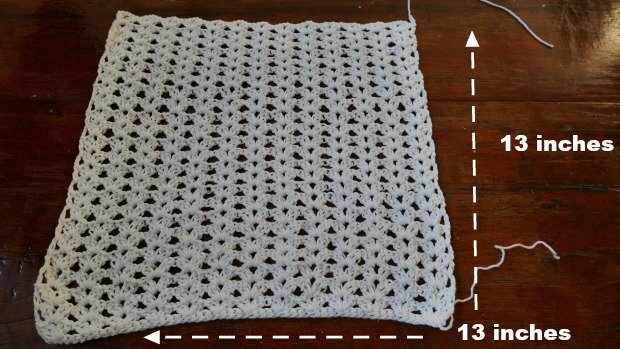 Pick up crochet hook size 4 mm and Start of by making a slip knot Then make 52+2= 54chains for size small and medium (foundation chain multiple of 4+2). ( size L 72+2 chain) , ( size XL 92+2 chain) and ( size 2XL 112+2 chain). 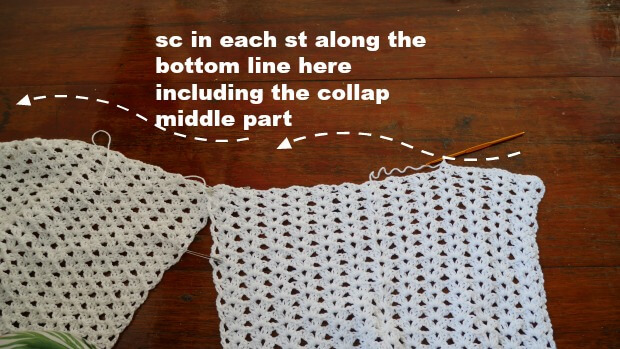 * skip 3 and make 2dc, ch2,2dc all in next stitch* repeat * to * across until end of the row, then you will have 2 stitch left sk1 and make 1dc in last stitch. ch3 and turn. Row3. now you will make * 2dc,ch2,2dc in the chain space of the previous row* repeat * to * across until end of the row. at the end make 1dc in ch3 space of the previous row. ch3 and turn. 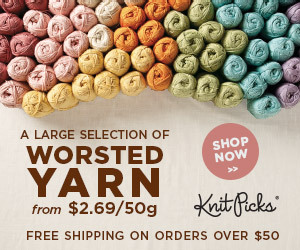 Repeat row 3 until you get around 13 inches long. Repeat the same process for the another 3 pieces. 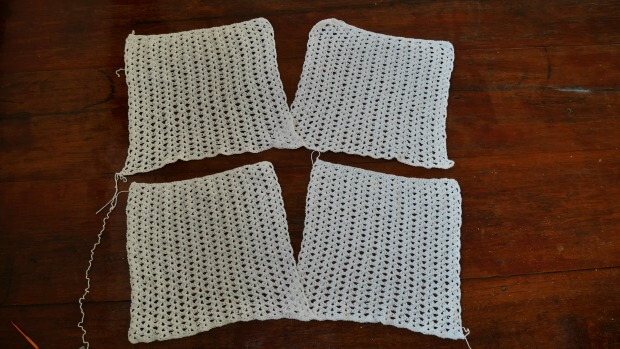 Now you have 4 pieces then we will ready to assembly the top part of the mini dress. Lay 2 pieces of rectangles in flatted and collapse each end about 1.5 inches like in the pic above and place stitch marker to fixed to position. Now we will sc along the bottom line here to connect to pieces of rectangles together. 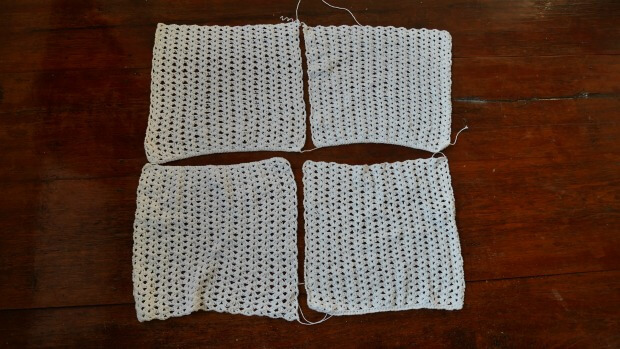 After finished first 2 rectangle then repeat the same process for the other 2 pieces. 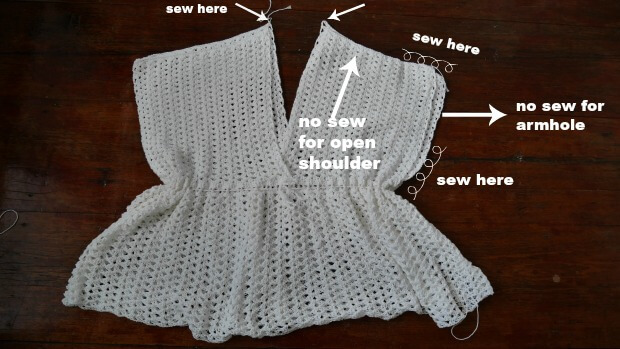 Now after you finished connecting 2 pieces of rectangles , now we have front part and back part of the top of mini dress. 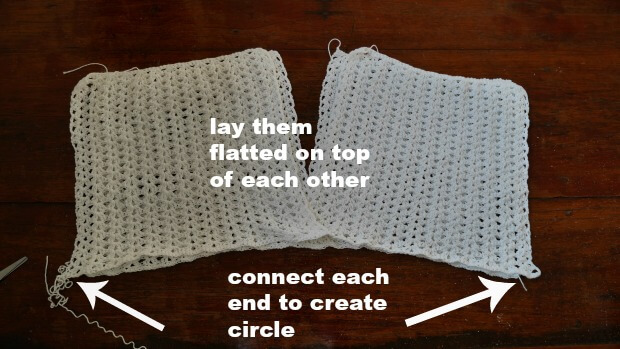 Now lay front part and back part flatted on top of each other and join each end to create the circle. be careful do not twist the part. Round1. 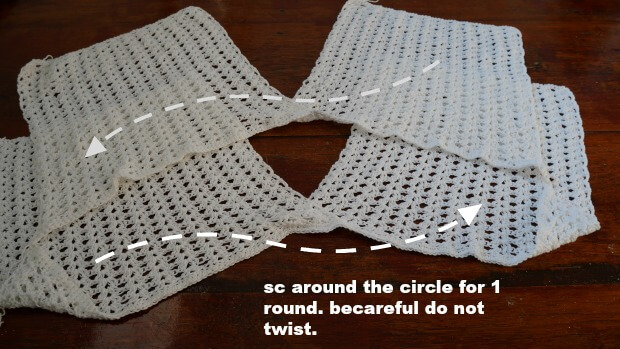 sc in each stitch around the circle for 1 round. Round2. *1dc in next st ,ch1,sk1 and make 1dc in the next st* repeat this* to* until the end of the round. Round3. 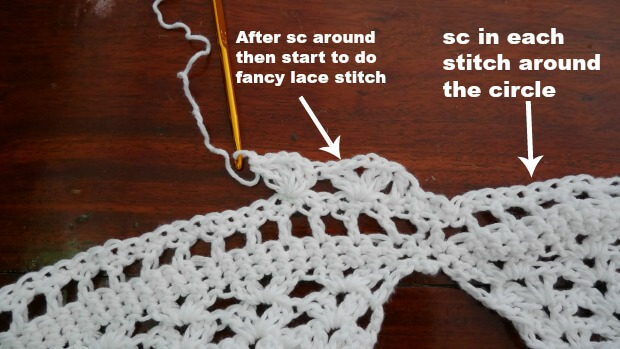 sc in each stich around , this round is the base of fancy lace stitch. Round4. 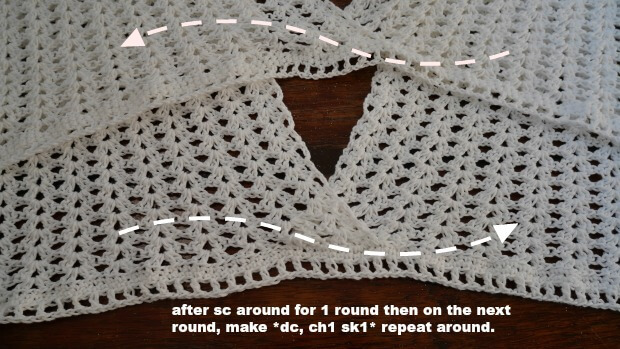 skip the first stitch and make 2dc,ch2,2dc all in the same of the next stitch , then* skip 3 and make 2dc, ch2,2dc all in next stitch* repeat * to * across until end of the round ( don’t join round), then if you have 2 stitch left sk1 and make 1dc in last stitch. 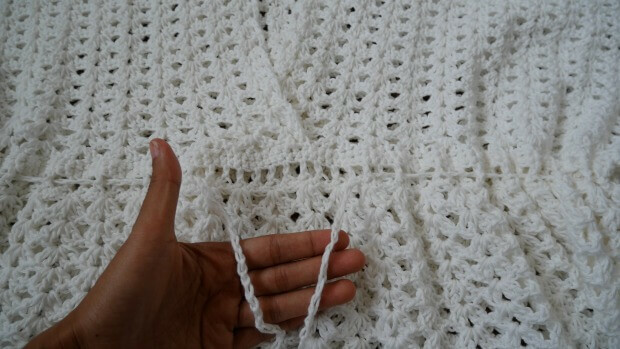 Or if you have 1 stitch left make dc in that st. ( don’t join round and continue to next round). Row5. now you will make * 2dc,ch2,2dc in the chain space of the previous row* repeat * to * across until end of the round. Repeat round 5 until you get your desire length of your skirt then, Fasten off. Time to assembly the top part of the mini dress. After we finished assembly minidress then we make the tie to tie the waist. I making about 200 chains. 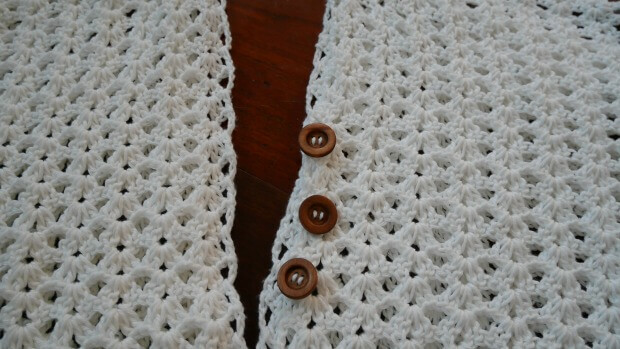 Add some wooden button by sewing using yarn needle. 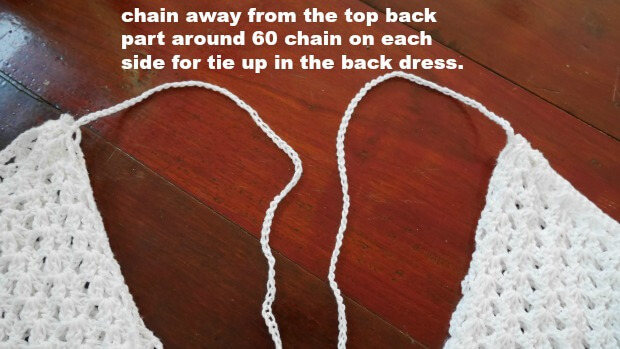 To secure the top to not slip of your shoulder by chain away from the each end of the top back part see pic below. Now you have it ! White hippie mini dress. How you guys enjoy it as much as I do. This is a beautiful dress. 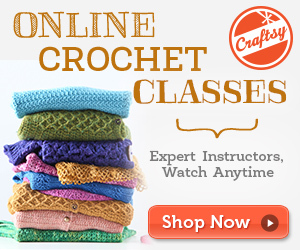 Easy to crochet and so elegant. I’m thinking of making it in black too. Great explanation and awesome pictures. Wow I think this is my favorite design by you so far! Really looks great! Aww that so sweet of you Candy thanks ^^. I loved making this dress for myself but even though I followed along for making a bigger size up it didn’t fit right. The panels dont need to be longer with wise but height wise. I normally fit into 3x shirts and I only needed the length for the large. I had to change the height to be taller in order to get the loose effect you have in the pictures. 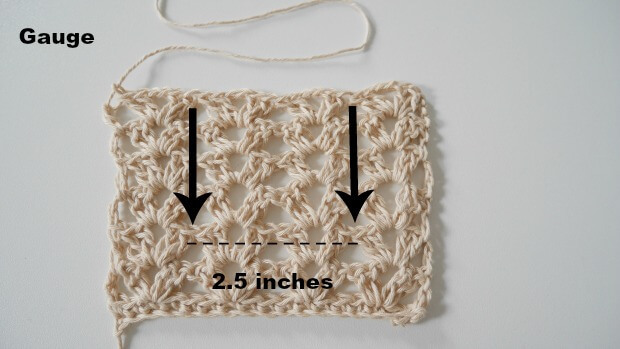 I just thought this would be helpful information for any of those wanting to make this in a bigger size.